The mosaic was discovered in the ancient city of Antiocheia. Photo Credit: AA/Archaeology News network. A rather unusual ancient mosaic has been discovered by archaeologists in the province of Hatay, Turkey, during excavations. 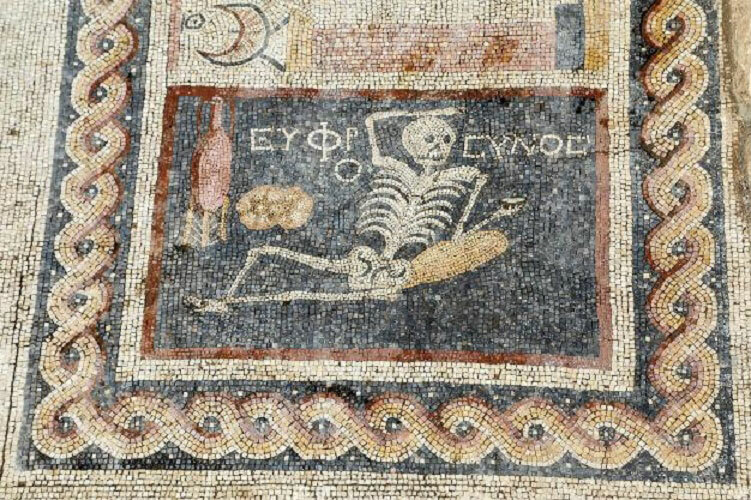 The mosaic, also called “the skeleton mosaic”, depicts a skeleton holding a drink with the inscription “be cheerful and enjoy life” in ancient Greek. The mosaic was found in 2012 during construction of a cable car. It was in the dining room of a 3rd century BC house, in the ancient city of Antiocheia, famous for the mosaics discovered in the area -the largest collection in Turkey- Demet Kara, an archaeologist from the Hatay Archaeology Museum stated. It is made of black tiles and comprises three scenes: in the first scene, a black person throws fire, which probably symoblizes the bath. In the middle scene, a young man is depicted running towards a sundial with a butler behind. Probably the man needs to have a bath in time for supper. In the last scene, a reckless skeleton with a cup in his hand is depicted in reclining position with the writing mentioned above. Another similar mosaic was discovered in Italy, although not as comprehensive as this one. The discovery is very significant since the mosaic is one of its kind in Turkey, a country with many ancient mosaics found in excavations.